Who has not had enough of classic rock, should add ELDORADO on the list. 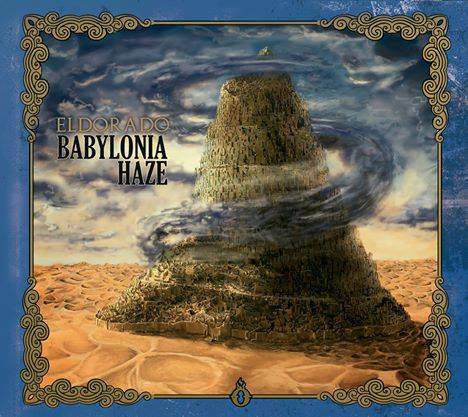 Formed in Madrid in 2007, 'Babylonia Haze' is their fourth self-released full-length, and if you dig bands like Deep Purple, Led Zeppelin, Uriah Heep, early Rush and so on, than you'll probably love 'Babylonia Haze'. It's obvious that these four guys are pretty talented and passionate musicians. The only thing missing is an own identity. These days, you have a lot of bands who refer to the above mentioned bands, but that is what makes it hard to stick out of the mass. Fortunately, ELDORADO have a couple of solid tunes in their luggage, such as the powerful opener 'Mad Woman' or 'Goodbye & Carry On', just to name a few. There are also some mellow songs as, for example, 'Resurrection Song'to guarantee the wanted variety, while the keyboard brings memories of Ken Hensley or Jon Lord. You may here tones that call to mind specific bands, yet they are fresh, performed with grit and feeling. Even though not all of the included ten songs do it for me, I had to admit that most of them are good. And I'm pretty sure that ELDORADO has hit the nail on the head for some of you. Those people should give this band a chance.